I featured this recipe in my recently released Flat & Happy Recipe Guide. It’s absolutely delicious and so easy to make. Perfect for a warm summer evening with friends and family, or just for yourself when you’re craving Mexican food like I seem to at least once a week. I’ve made this a few times, and once, when I didn’t have any chard, I swapped that for kale that was lightly sautéed. It worked just as well and added another dimension of flavor to the dish. 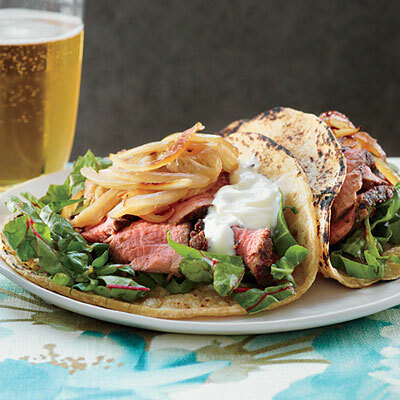 The recipe features fennel, which isn’t an ingredient you’d typically see in tacos. Even better, it’s caramelized with onions, which gives it a unique flavor. Look for bulbs with firm green stocks and shiny white bottoms. Brown blemishes or a wilted appearance mean they are past their prime, and lots of surface texture–fibrous strips running from top to bottom–is a sign they are too tough. 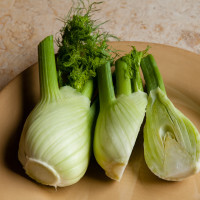 Rinse the whole fennel plant under cold water, using a sponge to scrub off dirt around the bulb if necessary. If the outer layer feels too thick or hard, remove it and throw away. Keep whole in your refrigerator’s crisper bin, where it will stay fresh for up to a week. If you must slice it in advance, store the prepped pieces in a ziplock bag between moist paper towels. Everything but the plant’s core is edible, although the tender bulb is usually the main attraction. Remove the upper stalks, then split the bulb in half to access the core and cut around it to remove. 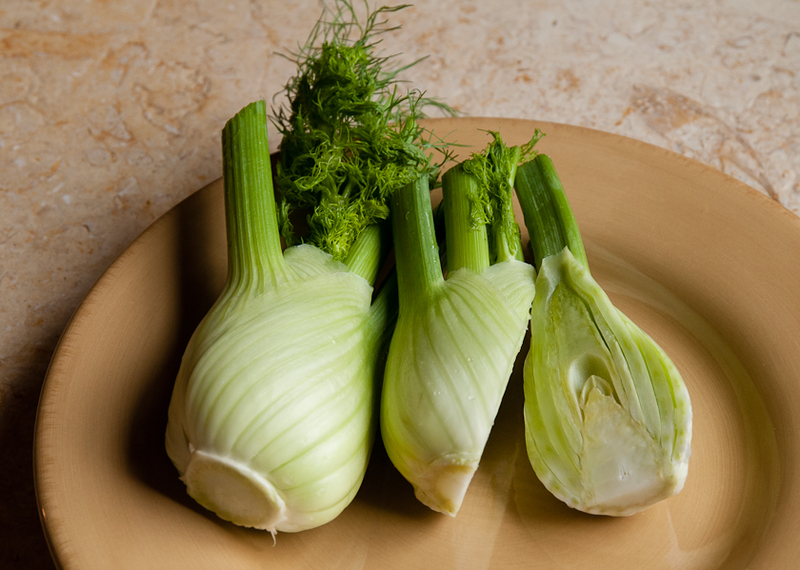 If you have any left over after making this recipe, try adding the raw fennel to salads for a zing of flavor. Or, save the caramelized mixture and add to scrambled eggs. Heat a large skillet over medium heat. Add oil to pan, swirl to coat. Add fennel, onion, ¼ tsp salt and ¼ tsp pepper. Cook 5 minutes or until tender, stirring occasionally. Cover, cook over low heat for 10 minutes or until fennel mixture begins to brown, stirring occasionally. Remove from pan and keep warm. mixture evenly over beef. Wipe skillet clean with a paper towel and return to medium-high heat. Lightly coat beef with cooking spray and add to pan. Cook 4 minutes on each side or until desired degree of doneness. Let stand 5 minutes to let the juices settle. Slice thinly for tacos. Combine Swiss chard and lemon juice, tossing to coat. Toast tortillas in a pan or toaster oven until tender and blacked in spots. Alternatively, you can heat up in the microwave if that’s easier. Arrange ¼ cup chard mixture in center of tortilla, top with about 1 oz beef and 2 tbsp fennel mixture.